El Azteca is one of the oldest and most intact residential neighborhoods in Laredo, Texas, with buildings dating from the 1870s representing nearly every major architectural type and style apparent on the border since that time. Throughout the early and mid-20th century El Azteca was a thriving community of homes and small businesses populated almost exclusively by Mexican and Mexican-American residents. it provides insight to an unparalleled border lifestyle that has granted it a Historic District designation from the National Register. But the heavily trafficked US Highway 83 and IH-35 which runs on the west side of the neighborhood terminating at the Juárez-Lincoln Bridge and Border Station that connects to Mexico together pose a threat to the neighborhood’s survival. In the late-1970s, the construction of IH-35 and the international border station eradicated more than 13 city blocks between downtown Laredo and El Azteca. In addition to removing many of the area’s middle-class houses, federal government installations’ barricades and fences set up a barrier between the neighborhood and the rest of downtown Laredo. 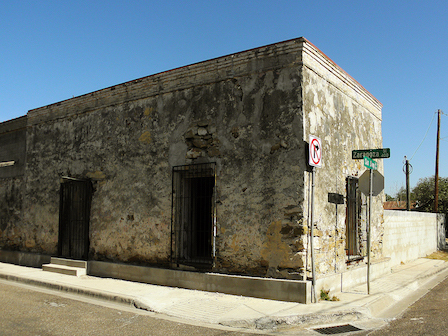 The neighborhood maintains a sufficient concentration of historic properties, some of which are rare, even extraordinary, examples of domestic and commercial vernacular architecture found only in the borderlands region of South Texas. However, El Azteca faces land-use changes, demolitions, and incompatible additions and remodeling. The numerous historic property demolitions are not only physically threatening but also psychologically diminishing the importance of El Azteca. El Azteca radiates a distinctive culture that should be preserved and showcased. Creating a space for community involvement will allow residents to unite when potential threats to their neighborhood arise. A comprehensive intervention would be creating a Community Preservation Plan that will serve as a reference for future interactions with the city government. A Community Preservation Plan for El Azteca to achieve permanent protection of its architecture, environment, and culture through a Local Historic District. This potential resource will collect information on both past successful and threatening events to serve as a guideline for any future community projects.